I Was working on a project, macbook volume was about on half, when suddenly an audio bug occurred with really loud screatching noise and not letting me pause it. After it stopped, the speakers were really quiet, and after the next restart they’re clearly blown. Initially I blamed the hardware, though the same thing happened a day later with my Sony 1000X-M3 headphones, luckily the headphones are ok, but that did give me a heart attack. The original discussion started back in November 2018, but since then others have come forward to say that they’ve experienced the same thing. Adobe Tech Support responded to one of the users suggesting that this was Apple’s fault. 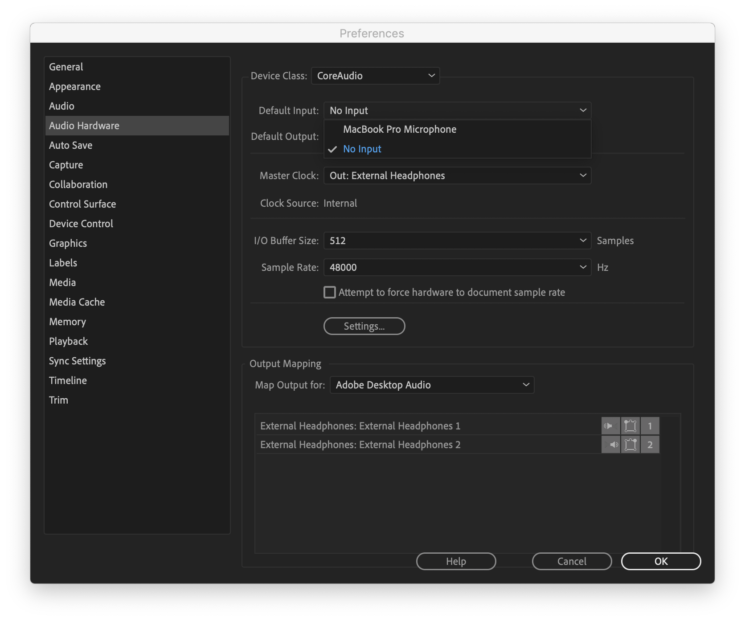 Another user was advised to change the audio hardware mapping in Premiere Pro, by disabling the default audio input. Neither Apple nor Adobe seems to want to take responsibility for this one, with each seemingly blaming the other. However, a piece of software should not be able to kill hardware in your computer so easily. Even if it is an Adobe bug that’s caused the problem, why does the Apple operating system allow software to let such a thing happen? One affected user told MacRumors that he was quoted a $600 repair bill by Apple to fix the issue. He says Apple claimed was so expensive because they need to replace the entire top case assembly – which includes the speakers, keyboard, trackpad and battery. I don’t know about you, but that seems excessive to me. I’m sure Louis Rossmann would agree, too. Regardless of whether or not Adobe caused the issues, why is Apple’s hardware not protected against things like this? For what a MacBook Pro costs (and then costs to repair), you’d expect it to have such basic hardware protection features built in. The dynamic speaker has been around since 1925, so it’s not exactly new technology. And it certainly shouldn’t cost $600 to replace. Given how long this “undocumented feature” appears to have been going on, multiple versions of Premiere Pro may be affected. For now, it seems that changing your default input may prevent the issue from popping up and save you a repair bill. Have you had this happen to you? How did Adobe and Apple respond? “Why is Apple’s hardware not protected against things like this?”: For the same reason why PC hardware is not protected against things like this. One of the rights granted to a standard user is changing the speaker’s volume. Since Adobe Premiere is most likely running in the user’s context, the rights to access volume control extend to the app. See https://www.codeproject.com/Tips/233484/Change-Master-Volume-in-Visual-Cplusplus and https://stackoverflow.com/questions/13139181/how-to-programmatically-set-the-system-volume if you’re familiar with C++ or C#. Now imagine someone having connected 500W worth of delicate audio equipment to his PC, running a modest speaker level of 5% (which is not totally uncommon). And then an application suddently changes that level to 100% immediately before sending a 5kHz sawtooth waveform (or white noise or 5Hz of bass, choose your poison) to the standard audio device. I even remember an old version of my VIA chipset driver occasionally emitting a VERY loud beep after logging on to Windows 7 x64. Remedy: Reboot, install new (=updated) driver. I was lucky that time since I had external speakers connected to my PC that were set to a very low level. It’s a bit like plugging an USB stick of unknown origin into your computer. Chances are that it might be an USB Killer (https://usbkill.com). Likewise, you run a crappy piece of Software on your Mac that does weird things with the audio mixer. Sue Adobe. Switch to HitFilm, Lightworks, Final Cut, Media Composer, Edius, DaVinci and live on.